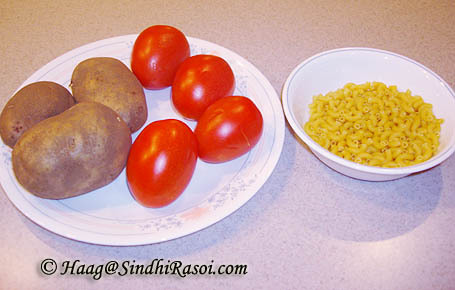 The lady originally from India, is now settled abroad , but Thankfully she still likes Sindhi food.Without any more delay I hand over to dear Haag, but not before expressing my heartfelt gratitude that she actually bothered to write the recipe and provide pictorials too. It all started when I tried to call my mom in India and wanted to talk to her.I could not(due to some reasons) so the whole day passed thinking of the good old days I had with my parents when I was living with them. Days ,months , years,and even decades have passed that I have moved away from India and now I live here with my husband and 2 children.Each day I come home from work I try to prepare a meal that we all have a liking for.Somehow never have been able to convince my son who says Bhaji should not exist.So I always have something special for him just like the way my mother did when I was younger. My daughter on the other hand has learnt to eat anything and everything and a HUGE THANKS goes to INDIA,and our India trips.Then, there is my husband who was so picky when we got married but times change and anything that I put on the table nowadays is always appreciated. Now back to myself,I remember When we went out with Mom and Dad and come home late we asked her to make this wonderful slurpy soupy MACROLI PATATA, thats what we called it back then in India.So soon as I got home, I went straight to the pantry, got out the Elbow Macaroni and started to cook this dish.Its so simple and yet Indian but very Sindhi recipe. Peel and dice potatoes about 1 1/2 in squares.Wash thoroughly. Wash and Chop tomatoes finely . (U can use canned ,pureed, stewed blanched any kind of tomatoes). Turn on heat and place pressure cooker on stove. Put Oil in pressure cooker add potatoes ,macoronis and choped tomatoes. 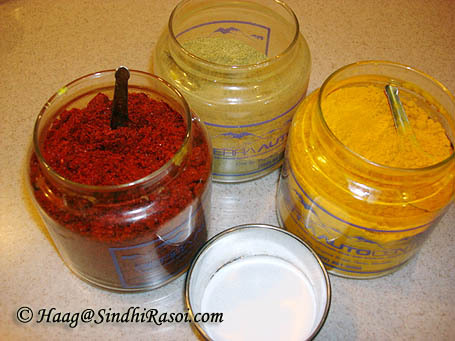 Add all dry masalas except garam masala. Keep bhunoing for about 5-7 mins . Add 2-21/2 cups water and put on the pressure cook lid. Let it whistle 2 times then lower the heat and cook for about 3-4 mins. 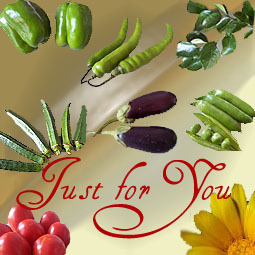 Garnish with garam masala and washed chopped coriander leaves. 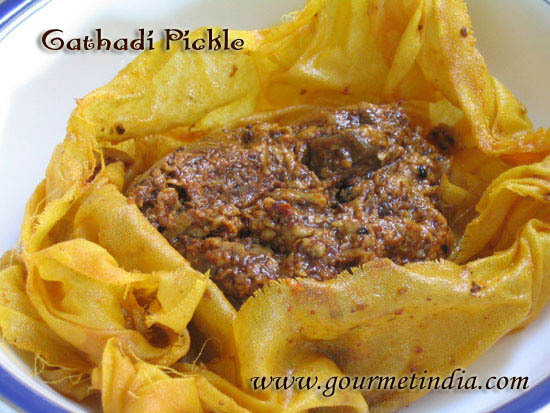 Add a little twist by dipping the crunchy fried phulkas(Tikkars). 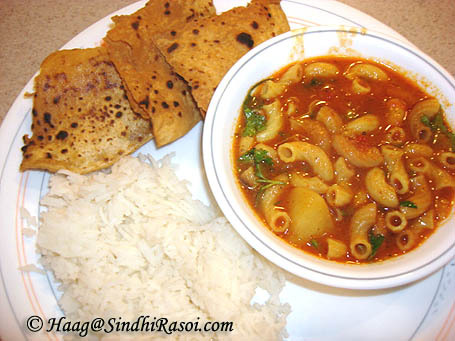 Make sure it is nice and soupy as it is fun to slurp the macaroni with rice. 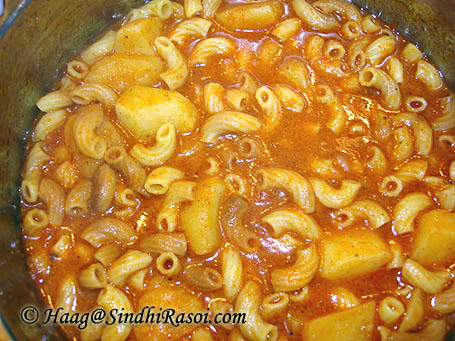 So here it is,Just for you …..
To all my friends and family from My sindhi kitchen to your sindhi Kitchen , Enjoy this mouthwatering Simple Sindhi recipe. beautiful and interesting combination, i will try this !! Thanks for a lovely recipe of maroni (or macroli to use the Sindhi rendition 🙂 ) with the lovely maanis. The winter is gone but in winter maani with Gur and butter (makhan maani). Kharak jo halvo is also made. wish you could give us recipes for it too. 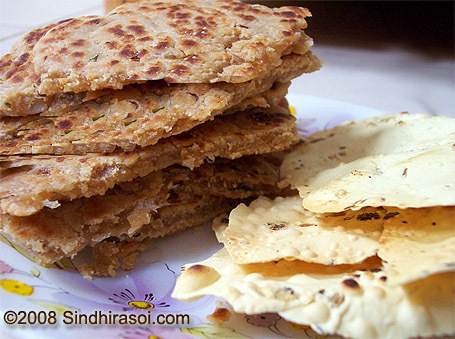 Keep up the preservation of Sindhi cuisine. You are doing a superb job. It looks so mouthwatering, sooo yummy n delicious! I tried it and it came out very well. My mom too used to make it . My children also liked it. Waiting for more of your tried and tested recipes. Mrs Haag, pls let me know when are u posting other recipes, & i agree with your son who says Bhaji should not exist..hehehe…but if you post such wonderful delicious recipes he & i shud both be convinced that Sindhi Bhaji’s shud exist. Mrs. Haag lovely post and mama too always made this for us she would also add phool tapasha or paneer at times. 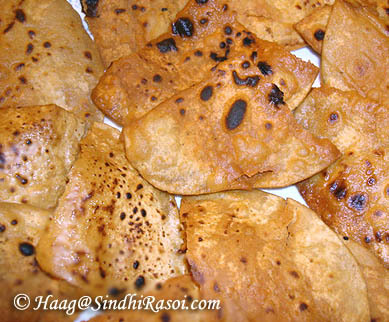 Looks yummy what with the fried phulkas this was typical sindhi lunch when I was young. Alka thank you for posting it. Wow wow wow delicious. It just calling to me saying eat me eat me. Yumm. Hey, my mom used to make this very often. Thanks so much for the recipe. slurp! slurp! Wow!! Alka I am drooling. Can i have some. Thanks for extending, i have one dish prepared for on VD. Something is waiting for you. Oops..thats surprisingly beautiful…what a treat for valentines day..Loved that. looks very simple and delicious. i will have to try it. love this ..My friend mom used to make this..we used to grab from her and eat it all..Delicious.. This recipe is totally different! Looks very delicious! I know this is so so tasty! 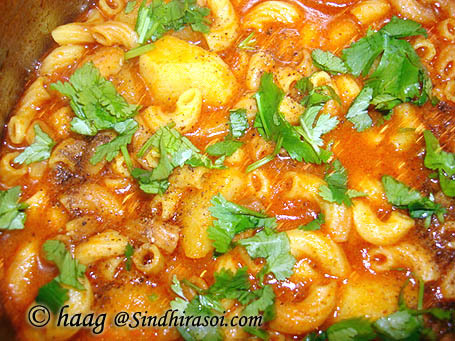 My Sindhi friend Bina makes this often – any idea how macaroni got incorporated into Sindhi food? Alka another great new kinda fmouthwatering ood:-).. Thanks to Mrs. HAAG! Wonderful Valentine surprise from Sindhi Rasoi.